Papua New Guinea Carving is some of the most valuable and sort after pieces of tribal art. There are numerous different PNG carving types, which vary depending on the region they come from. This article helps to visually show the main types of Papua New Guinea Carving. It should help the reader identify which region their figure comes from. The best known New Guinea Carvings come from the Sepik River but there are numerous different types of sculpture throughout New Guinea. Sepik Sculpture has so many variations that most of these styles are covered in a separate article. I Buy Old Papua New Guinea Carving and Oceanic Art if you have one to sell please contact me. If you just want to know what your PNG carving might be worth please send me an image. I would love to see it. Papua New Guinea Carving normally represented gods deities or ancestral heroes. They were sometimes made free standing but are also often found as part of a larger object like the top of a house pole. PNG carvings vary in size from very small charms hidden on your person to monumental sizes. Most figures have a cult/religious purpose and are full of energy and life. In New Guinea, it is only men who are supposed to see these carvings. Women and uninitiated male children are Taboo to go near structures containing them. The following is a visual guide on types of Papua New Guinea Carving but due to the huge variety throughout the country, it is far from inclusive. It is probably better to think of this article as a brief introduction to this fascinating group of oceanic art forms. If you want more detailed information about a particular piece please feel free to contact me. There are several different types of PNG carving that come from the Papuan Gulf. Imuni Figures are three dimensional and often carved from mangrove wood. Part of the charm is that the carver uses the natural woods shape when carving. Flat figures from the Papuan Gulf are Bioma and older ones tend to have more fluid forms and often have a pierced nose. 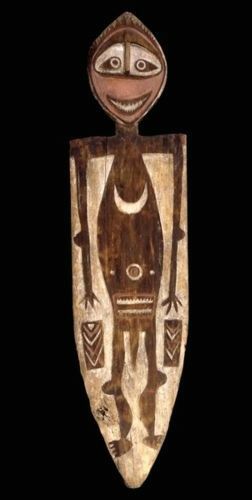 Hohoa boards are often mistaken for shields. Even though they are flat they are actual figures that represent ancestral heroes. Nearly all have concentric circles for eyes. Old examples have raised noses and sometimes forehead. Skull racks are very rare. They were to hang the skulls of dead enemies. They come in different styles but all have somewhere to hang skulls from. Figures from Turama River are rare but tend to be mildly triangular in cross-section. They normally have tear shapes around the eyes and designs on the stomachs. Turama also has skull racks but they are very rare and used for hanging skulls of hunting trophies and not human skulls. Papua New Guinea carving from the Gogodala are made from softwoods and often have small red seeds around the eyes. They typically have a conical hair coiffure and are brightly painted. PNG Carving from the Fly River is extremely rare and most have early collection dates. Large figures made for mourning ceremonies are some of the most powerful of all New Guinea art. Smaller personal charms tend to be flat and mostly come from Kiwai Island. The Massim do some of the most refined Carving in Papua New Guinea. Massim Figures are rarely free standing e and the majority are attached to the end of a lime stick or canoe part. They are usually made from ebony or very dense hardwoods. The designs are very precisely carved and with a refined almost Polynesian finish. 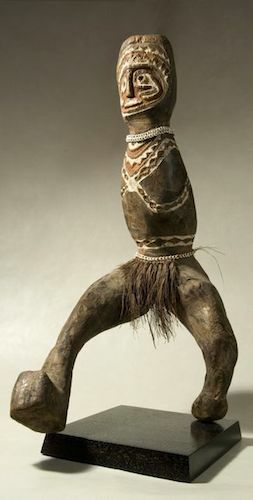 They are the only figures from new guinea that are sometimes made from more than one piece of wood. traditionally this form of tribal art was burnt after use. Malangan culture also produced fantastic varieties of masks. Admiralty Island figures come from Manus Island and they are usually predominantly dark red in color. They do come free standing but can also be on the end of poles and native ladders. Papua New Guinea carving made by the Tolai are either made from wood or chalkstone. They are rare and early examples were predominantly white with some red or Ricketts blue. The first comes from Rommekun and has distinctive hooks on the figures face. The second from Kominimu have a unique eye shape. The eyes are almost always a semi diamond shape taller than they are wide. Figures from the Huon Gulf and Tami Island tend to be very cubistic and often have the shoulders at the top of the head. They are sometimes found free standing but more often as part of a bowl or a Wooden headrest. Sulka Figures are extremely rare. They are normally part of large woven masks or attached to large masks. They have a distinctive pink or faded pink pigment. Wooden figures are made of a very light soft wood. The Sepik River is one of the greatest art producing areas in the world. There is such a variety of Sepik Figures and styles that it needs its own article. This is just some examples, so I hope you can appreciate the vast variety of Papua New Guinea Carving. New Guinea is probably the most prolific figure-producing region of the World after Africa. As Pacific Art, they are extremely expressive and come in a vast variety of sizes forms and functions. It is a great pity that the majority of people who visit New guinea only get to see the modern tribal art produced for sale to tourists. They often miss the fantastic variety of other figures this diverse country has to offer. If you enjoyed this article you may also enjoy my article on Aboriginal sculpture.